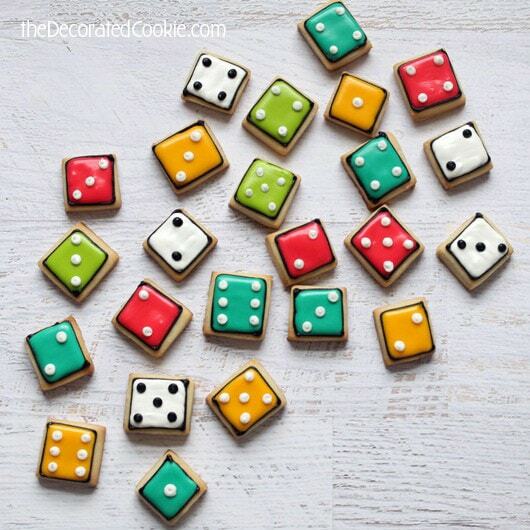 Fun game night idea: Dice cookies. My daughter’s school held a game night potluck this weekend. A local shop here in DC, Labyrinth, brought tons of games for the kids. And naturally, for potlucks, I bring cookies. Whenever I’m making cookies for a crowd I cheap out, I mean, frugally stick with bite-size. That way, you can bang out more volume for one batch. 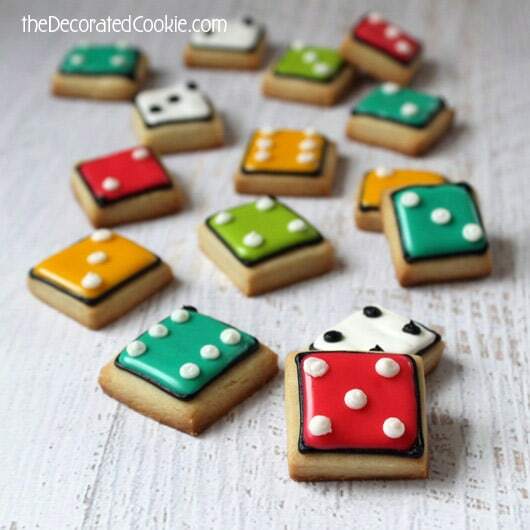 So I made these mini dice cookies. But first, I have a pressing question for all you hipsters. As we were driving to my daughter’s school in DC, we passed a hipster bar. A hipster dude was sitting outside on this unseasonably warm evening in bright yellow-as-a-ripe-banana pants. 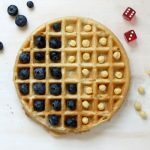 I mean, yellow-er than those yellow dice up there. Is this a thing now? I can see him walking into the store and being wooed by the bright yellow pants as they sat among a rainbow of other brightly-colored pants. But on his person, sitting at that hipster bar among a sea of muted hues, well, I’m guessing if you were a mile away on flat, uninhibited land, all you would see are these pants. Now, he was sitting there sipping his beer like “I’m totally owning these yellow pants.” So maybe being a beacon was the goal of said pants. And perhaps, just perhaps, I’m officially too old to appreciate the pants. Sigh. Instead, I go play games in a school cafeteria on a Saturday night. 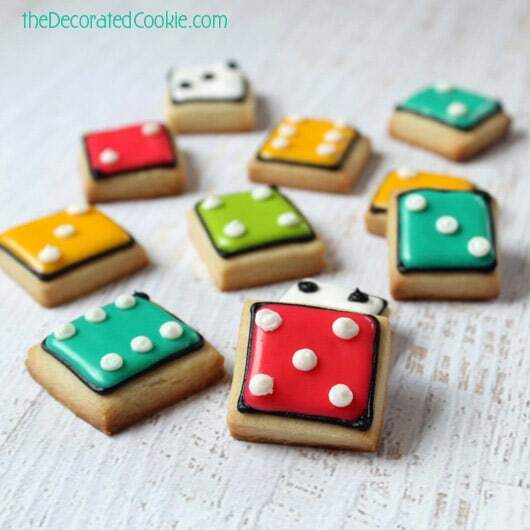 Decorate some Mr. Roger’s Neighborhood cookies. 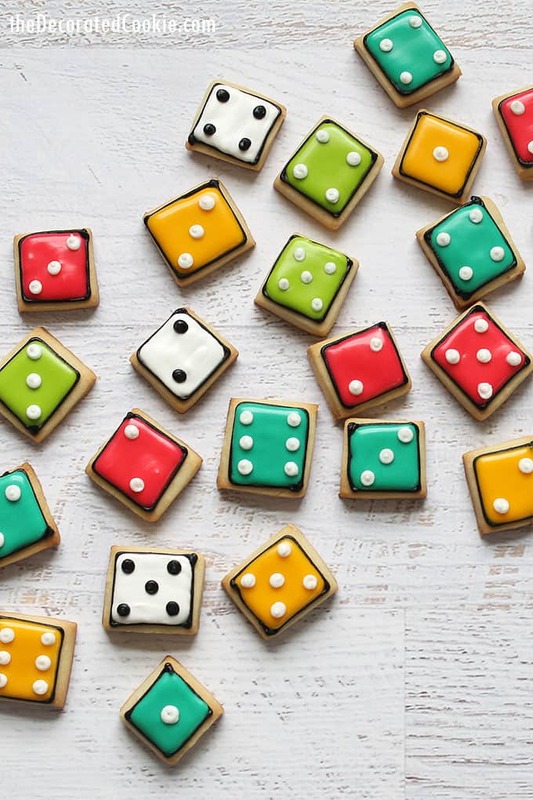 ’80s fans will love these Pac-Man cookies or Space Invaders cookies. Or maybe Frogger cookies? Try some Poop Emoji cookies! 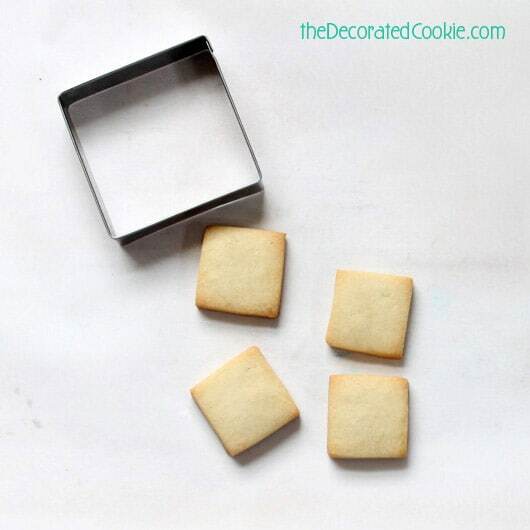 *For the cutter, I used my 2-inch square cutter and cut each in four to make 1-inch square cookies. Find cookie cutters, decorating bags, couplers and tips at the craft store. Find information on buying food coloring HERE. (Bright White, Super Black, Sky Blue, Electric Green, Egg Yellow and Electric Pink used here.) 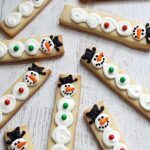 Find cookie decorating supplies information HERE. And scroll to the end for more resources. For basic cookie decorating instructions, click HERE. Bake the cookies. Prepare the cookie dough according to the recipe, chill, and roll out about 1/4-inch thick. Cut out your squares and bake according to the recipe. Let cool completely. Prepare the icing. 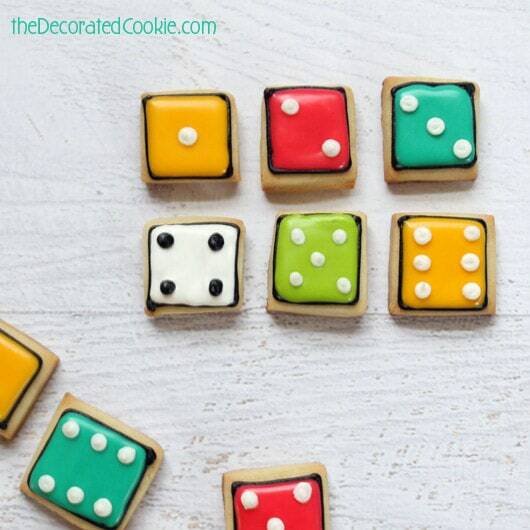 Prepare the icing according to the recipe and divide for each of your colors. 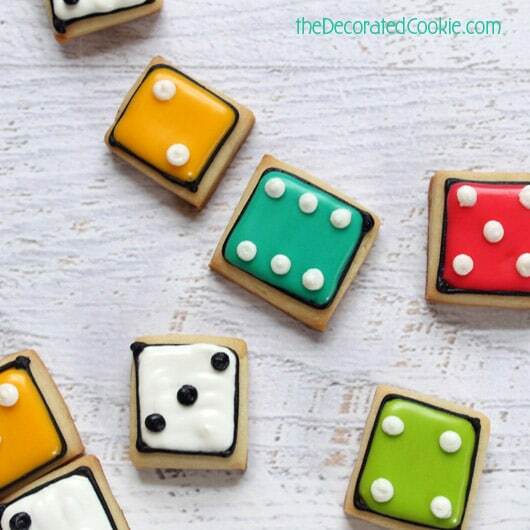 Color the icing. For the black, which is the outline color, you want the icing thick enough to keep its shape. I also made a white icing thick enough to hold its shape for the dots. For each color and additional white icing, I added a few drops of water so the consistency was a bit runnier. If you overturn a spoonful, the icing will fall into itself in about 10 seconds. Prepare decorating bags with couplers and tips, fill with the icing, and close the bags tightly with rubber bands. 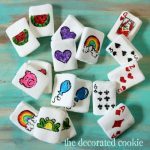 You’ll need size “2” tips on the thicker black and white bags and size “3” or “4” tips on the fill-in colors. 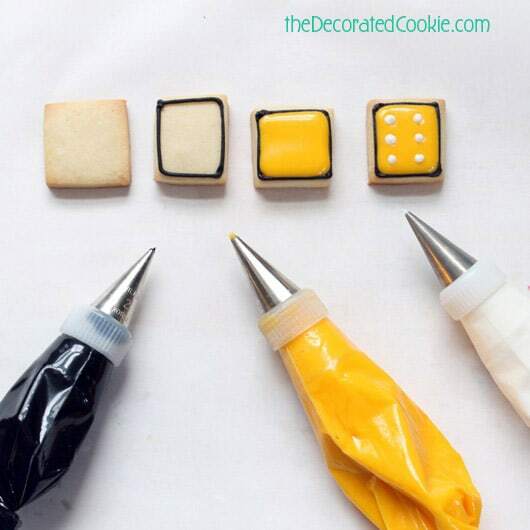 Decorate your cookies. Outline with black using a size 2 tip and let set about 15 minutes. Fill with any color of your choice using a size 3 or 4 tip. Let set well and pipe dots on top with a white size 2 tip. Let dry overnight before packaging and handling. These are adorable! Love them! 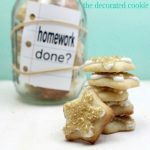 Oh, such a cute idea and your cookies look so adorable too! !